What's the best software for ripping Blu-ray ISO to Nexus 10 on a Mac computer? What’s the best software for ripping Blu-ray ISO to Nexus 10 on a Mac computer? 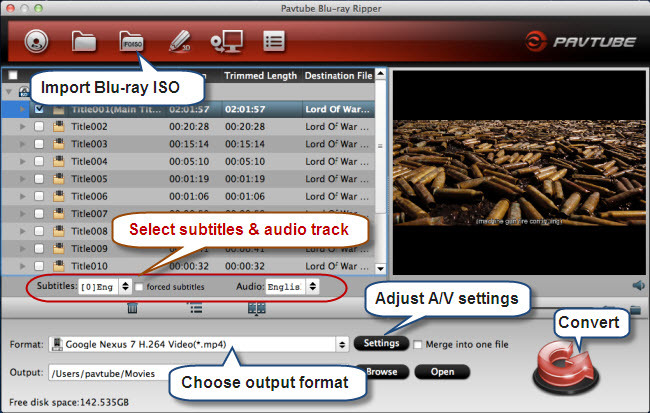 Pavtube Blu-ray Ripper for Mac is considered as the most appropriate Mac app to do so. It is mainly used to rip Blu-ray discs, Blu-ray ISO image files, Blu-ray folders, as well as standard DVDs, DVD ISO/IFO and DVD folder to any format you want for viewing on a wide variety of multimedia devices, like Google Nexus 10 by Samsung, Apple iPad, Amazon Kindle Fire HD, Microsoft Surface RT/Pro, Asus Transformer, Motorola Xoom, Samsung Galaxy Tab, Galaxy Note 10.1 and so on. 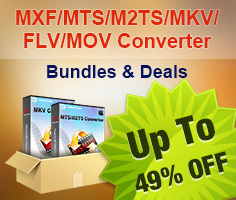 With advanced audio and video synchronization technology, it keeps users away from audio and video out of sync issues. Moreover, the Mac Blu-ray Ripper enables users to select desired language as output audio track and subs from the source Blu-ray files, no matter your mother tongue or foreign languages, so that you can watch the converted files on your device with your wanted audio and subtitles stream. How to process Blu-ray ISO to Nexus 10 backup on Macintosh? * The free trial version will generate files with Pavtube watermark standing in the middle of the image. To get rid of the watermark, you need to pay for the retail version. 1. Run Pavtube Blu-ray Ripper for Mac as the best Mac Blu-ray Ripper for Nexus 10. Click “IFO/ISO” icon to load Blu-ray ISO file stored on your HDD. Check the movie title you want to convert, and click the scroll down lists of “Subtitles” and “Audio” respectively to select your wanted subtitles stream and audio track to be remained in the output files. 2. Move to “Format” menu and choose “Google Nexus 7 H.264 Video (*.mp4)” as output format from “Android” catalogue. 3. Click “Settings” button and enter “Profile Settings” panel to custom file quality for Nexus 10 by adjusting video and audio parameters. Bitrate (kbps): 2000 - to generate files with better image quality, adjust the video bit rate higher than 2000 kbps. Notice that the higher bit rate will produce video with larger file size. Learn to custom an appropriate profile for Nexus 10. 4. Click “Convert” button to start copying Blu-ray ISO file to MP4 for playing on Google Nexus 10. As soon as the BD ISO to Nexus 10 backup is finished, you can click “Open” button to get the converted files. Now you are ready to transfer the ripped Blu-ray ISO videos to your Nexus 10 for entertainment.